A simple method of protection, connects the metal to be protected to a more easily corroded “sacrificial” metal to act as the anode. The “sacrificial” metal then corrodes instead of the protected metal. For structures such as long pipelines an external DC power source is used to provide sufficient current. Cathodic protection systems protect a wide range of metallic structures in various environments. For further information about Cathodic protection please see Wikipedia. 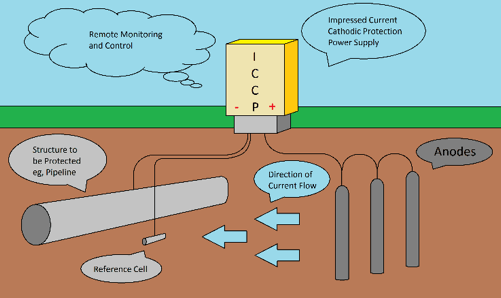 Impressed Current Cathodic protection (ICCP) consists of anodes connected to a DC power source, often a transformer-rectifier connected to an AC power source. For pipelines, anodes are arranged in ground-beds either distributed or in a deep vertical hole depending on design, field and current distribution requirements. Duvine has been manufacturing switch-mode rectifiers for over 30 years, which are the ideal power source for Impressed Current Cathodic protection solutions. Features include, Remote monitoring and Control, integrated current interrupters and a variety of different types of enclosures. The output DC negative terminal is connected to the structure to be protected by the cathodic protection system. The rectifier output DC positive terminal is connected to the anodes. The AC power is connected to the rectifier input terminals. The output of the ICCP system should be optimised to provide enough current to provide protection to the target structure. Duvine’s switch mode-rectifiers are designed so that the users can select from a number of different outputs: Constant current, constant voltage, constant potential or a mix of all three, depending on the requirements. Our CP power modules are ideally suited for use in both single output and multi-zone systems and can be used in parallel for higher current requirements up to 1000A per output. We custom-build integrated solutions to meet customer’s exact specifications and these can be provided in a wide range of enclosures, to meet the particular site requirements.